Have you ever tried playing roulette? This gripping game of chance has lots of fans all over the world. Why is that so? The game itself provides players with interesting gaming experience, easy and straightforward rules of roulette, high payouts and comparatively low house edge in European roulette. Those who like challenges and adrenaline rush may try their luck by playing roulette of other type, for example, American roulette wheel as it has two zero slots that increase the house edge to 5,26%. Being a very easy game to play, roulette has its hidden dangers as due to the high payouts many players lose control of their spending! It is not wise to try beating roulette by means of catching up. Roulette is a pure game of luck and every spin is an independent event with no influence on the future outcomes. However, there are players that make use of the different roulette betting systems like Martingale roulette strategy, D'alembert or Labouchere systems, or even create their own. One of the strangest betting systems that has no mathematical calculations or scientific background is called Dopey experimental system. The main idea of this experimental betting strategy is to decide the sum of money you are ready to spend when playing. It means that you have to be ready to lose this sum of money in case of constant losing. The chosen sum has to be divided into 35. This will be the sum for one bet. It is necessary to know how to place bets in order to play roulette but Dopey system is very easy as a player simply chooses one number to place the bet. The system requires placing one and the same bet for 35 times in a row no matter loses or winnings. The amount and the number on the wheel stay the same. This system has no wisdom explanation for its existence but it is considered that if a player bets 35 times on one and the same number, the chances increase to 60%. 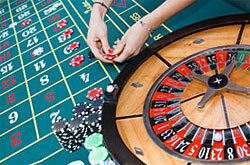 It means that after 35 spins of the roulette wheel the chosen number may eventually win.